AAAF has been running our Wigs For Kids Program since 2012 to held young people and their families with the costs of purchasing a wig. At the end of 2017 AAAF had provided $118,000 in grants. This program was originally supported by a grant from the CBA Staff Community Fund, who we thank for helping us get this life changing program off the ground. In recent years, the generosity of supporters who have donated their hair and raised funds has enabled AAAF to assist other groups, including university students and those over the age of 55 in once off programs called Wigs for Big Kids and Wigs for Biggest Kids. AAAF believes that whether to wear a wig or not is a personal choice. 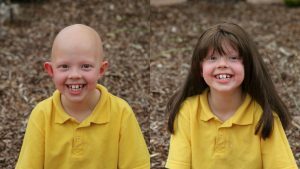 As government assistance and Medicare / Private Health Care rebates are limited and vary across states, AAAF established the Wig for Kids Program to ensure that children wanting to wear a wig get the information, service and support needed. You can see testimonials from other Wigs for Kids grant recipients here. The amount awarded is a total of $400.00 inclusive of GST. A child for the purpose of this program is a person of 17 years or under. AAAF can provide a list of Wig Providers in your state. A Wig Provider needs to be selected as part of this application. AAAF has the right to refuse the Wig Provider if we do not believe the Wig Provider will provide an overall positive experience and quality product for the child. The successful applicant will receive a voucher to present to the Wig Provider on collection of the wig. The Wig Provider will invoice AAAF directly quoting the voucher reference number. Before deciding on a wig, it is best to do some research on the best type and style of wig for you. AAAF has compiled a document to help you get all the information you need to make the right decision for you.